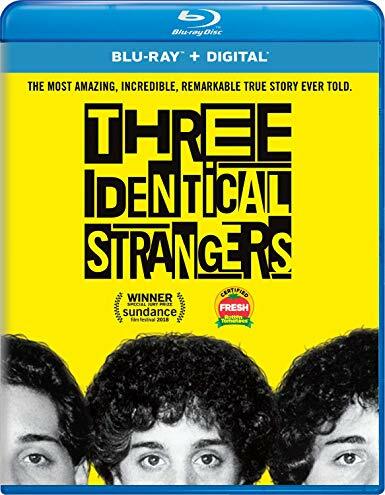 In 1980 two identical twins, ostensibly separated at birth, discover each other through shared connections at a New York community college. The story went front page after reporters confirmed their shared origin from a Jewish adoption agency. When a third sees the story he realizes that he too is a separated brother and the story goes nationwide, with all of the late shows and afternoon talk shows featuring them. Director Tim Wardell picks up the story nearly 40 years later, with the reunited triplet brothers having lived their lives, building a business together and experiencing joy, sorrow and loss. An unexpected twist is found: Their separation may not have entirely been an accident. And they may not have been the only ones! We are led to wonder: could their journey have been about the fundamental question of nature vs. nurture? And if so, which weighed most on them? 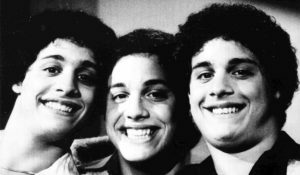 Plot: In 1980 New York, three young men who were all adopted meet each other and find out they're triplets who were separated at birth. Then they discover why. Knowing only the bare basic facts of the brother’s separated at birth saga going in I was immediately hooked on this story. As the onion unwraps about the initial meetings between brothers Robert Shafran, Edward Galland, and David Kellman, we learn their similarities and instant kinship. But this documentary doesn’t stop there, it pulls at the string of ‘how could this have happened’ and the unexpected answer to that question is not fully resolved, but the pieces we DO learn are heart wrenching, anger inducing, and absolutely fascinating all at once. Every participant masterfully tells their part in the tale, and we soon learn why some of the voices are not their to tell their own side of the story. 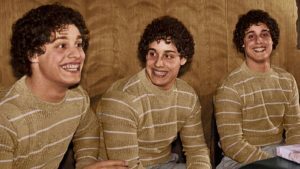 Three Identical Strangers won the 2018 Sundance Festival U.S. Documentary Special Jury Award for Storytelling for damn good reason and is worthy of a Home Theater Forum Highly Recommended rating. The interview sections are produced with a simple studio setup that highlights the interviewees facial movements and really brings out the raw emotion they encounter when telling their parts of the story. There are a number of historical recreations that utilize significant haze and out of focus effects that are inherent to the stylistic choice the director has made. These ‘flaws’ give a dreamy and someone muddled atmosphere that is perfectly rendered and should not be considered defects in the image quality. It’s one of the best produced documentaries I’ve seen, and the execution of video quality is perfect on both fronts. 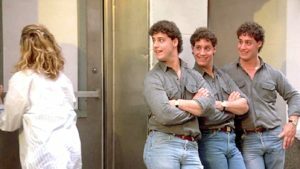 In a rare turn for a documentary film, Three Identical Strangers is presented in DS-HD Master Audio 5.1 and makes use of every channel available throughout the film. Auditory cues are placed in all corners, with sound effects for cars, cities and college and even medical equipment are natural, pleasing and engaging. The interviews are crisp and clean, and really allow the participants personalities to shine through. A plus quality for a film, an auditory gem for a documentary. There’s only a couple of extras here. Most notably is a 15 minute clip from a Q&A with the director, cast and crew. That is a must a see. In addition there is a feature commentary (not my bag but could be worthy of your time if you dug the story as much as I did. There is also a very week photo gallery and the trailer. 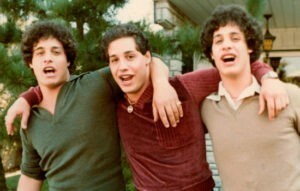 As noted Three Identical Strangers easily earns a Highly Recommended from me, and shoots right into my top five or higher of favorite documentaries. I’m reluctant to discuss anything past the brothers introductory story because it really is something that will blow your mind when you dig into it, and as the Q&A notes the story is not quite finished yet. Count me in for following the rest of the story as it develops. It is one for the ages! Thanks Sam! I loved this in the theater, where I was lucky enough to see it with a packed house, and you could feel how shocked and enraged the crowd was. I second your recommendation of the film. However, I'm not sure I would play it more than once or twice, so it's not a priority for me to purchase right now. I can tell you that there are tonnnns of folks hoping this comes to Netflix! I don't buy many documentaries myself, but this is one I am happy to have in my library. I have already shown the Blu to my parents and they were as fascinated as I was! For me, it also comes down to being released in a very crowded month full of titles I will watch more often. I might consider it down the line, as I would like to see it again, but right now there are too many great titles coming out all at once to get them all right away. Thanks for the review, Sam. I had read about this (I think in the NY Times) and might have missed this release if I hadn't seen your review. Aw shucks, thanks! Glad I got it a little exposure! Sam (and anyone else who's seen it), any ideas who they could cast as the triplets? Unless there happen to be identical triplet actors in the right age range, presumably they'll have to go The Parent Trap route and cast one actor to play opposite two other themselves, so I guess they could go with anyone, depending on whether they want them to resemble the real triplets or not. WOW That's really cool! Steve Shrippa as the modern brothers maybe, and Jesse Eisenberg may be too old now but him with black hair as the college students could work. Good idea. I especially like the Eisenberg. I wonder if they will split the role as you suggest for different ages, or if they might go with one actor and use a combination of makeup or the digital de-aging Marvel has been fond of to do different time periods. I finally pulled the trigger and got a copy of the Blu. Peg was really intrigued by the premise…so that was the title which shot to the top of our potential viewing stack. We were both rapt from beginning to end. It might not be the best-organized documentary I've ever seen…but the subject material is compelling. It amazes me that the brothers are not able to force the unredacted release of the material which applies to them considering the great wrong that was done to them. I get the sense that if it were me it would become my life's mission to find out everything they could about their situation and the people that perpetrated this mess on them and their families. I would strongly advise anyone who views this doc to check out the Q&A session tucked in with the bonus features on the disc. It gives some great supplementary info and a bit of an update on the story (much like that link to the LA Times article which Sam posted near the top of the thread). One of the things that really struck me was how one of the wives (in the Q&A) commented that its not just the impact of the ruse on the brothers…but the impact on their adopted families, their wives, their children, etc. I am left after watching it wishing that their would be some accountability and responsibility on the part of those involved. The smugness of the La Jolla, CA woman who was an assistant in the study was maddening. And the demeanor of the known researcher (willing to talk) was most aggravating. Like I said…compelling stuff. What a sad tale. Well said @Mike Frezon – Thanks! Hey I just heard that CNN is going to show my favorite ever documentary next Sunday night. If you haven’t seen it don’t miss it! That's a very crowded night of programming though, since it will be airing at the same time as the SAG Awards on TBS/TNT and Fox's broadcast of Rent Live. That too (I don't get HBO.) I was just thinking more in terms of big live events. 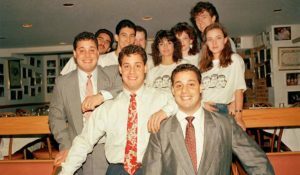 But I doubt Three Identical Strangers is a huge blockbuster ratings play for CNN anyway, so it should do fine. This is for rent in HD on Google Play and other streaming systems. Just saw it on CNN. Heartbreaking.